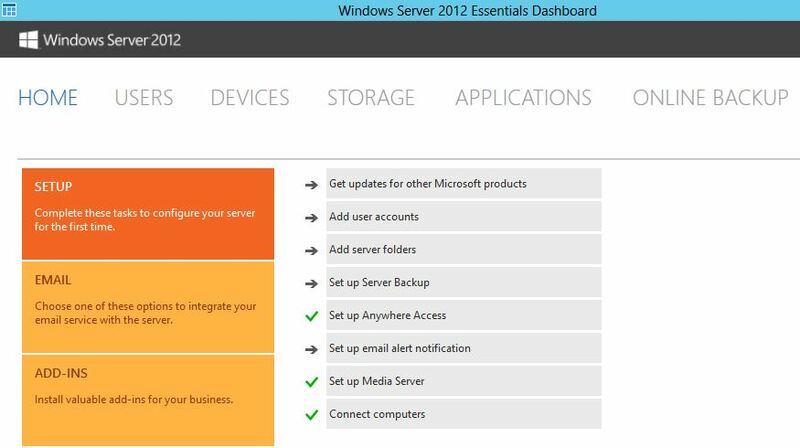 I’m continuing on my Windows Server 2012 Essentials kick this week. I know R2 was released last week, but the procedure is basically the same. I’ll update this post with the R2 instructions in the coming weeks. 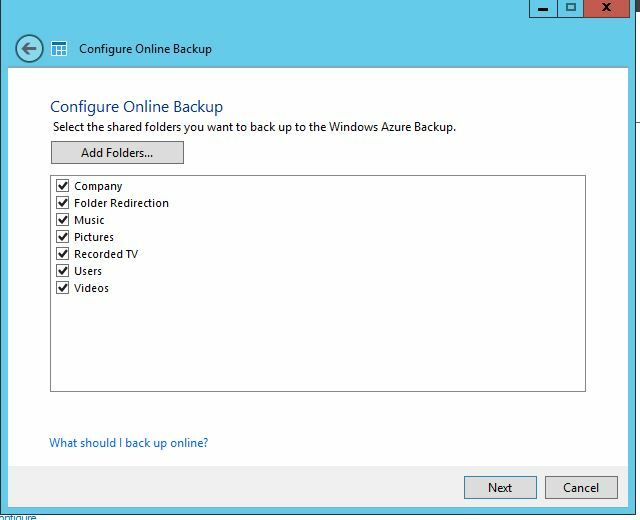 We all know we should be doing off-site backups as part of our backup routine; see 3-2-1 Now Backup for more details about a backup strategy for your small business. 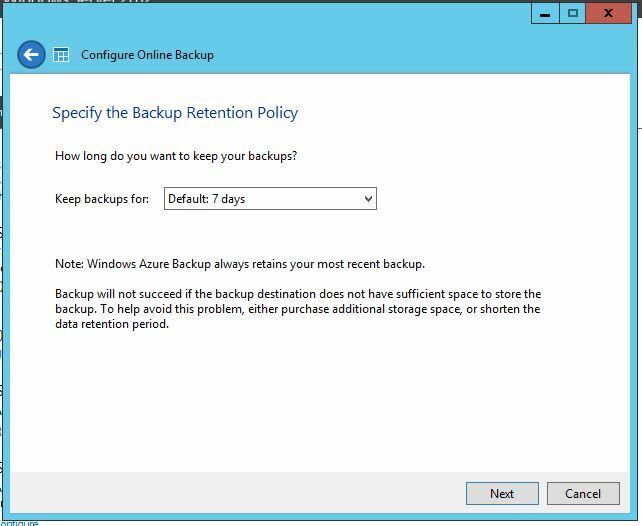 And as I write this, I’m thinking, when was the last time I performed an offsite backup? Yep, it’s been awhile, because it’s a manual process and I will “get around to it”. Unfortunately, I see this too often at my clients as well, and for the same reason. It’s a manual process and it get puts on the back burner. Luckily, Microsoft made this an automated process in Windows Server 2012 Essentials, so we don’t have to think about it and if the unthinkable did happen, the data is safe on the Azure servers. Azure is Microsoft’s hosting platform. 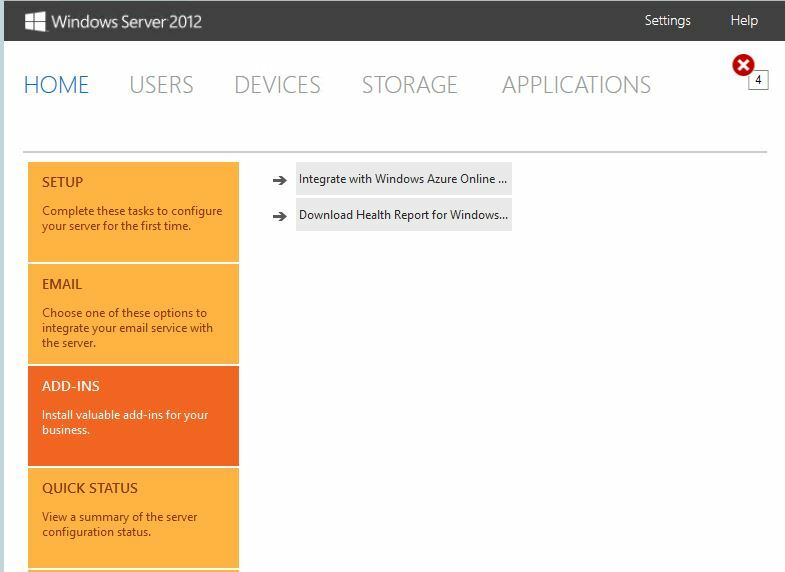 For more details about the features of Azure, see http://www.windowsazure.com/en-us/. Now on to the how-to. Please note this is long, and contains screen shots to help you step through this process. I started by creating an account on Azure. Go to http://www.windowsazure.com/en-us/ and sign up for an account. 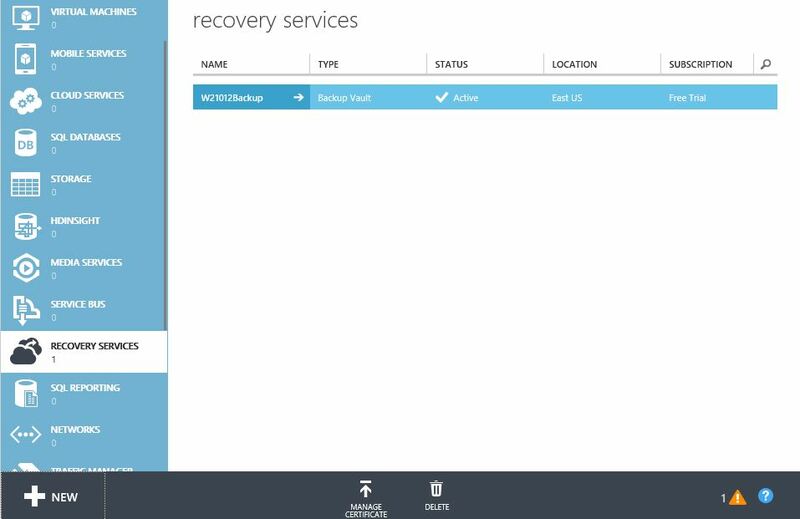 Once your account has been created you will need to enter the Portal and create a recovery vault in the Recovery Services module. Launch the Dashboard from your server. Click Add Ins and then Integrate with Windows Azure Online. You will be taken to the Azure website. 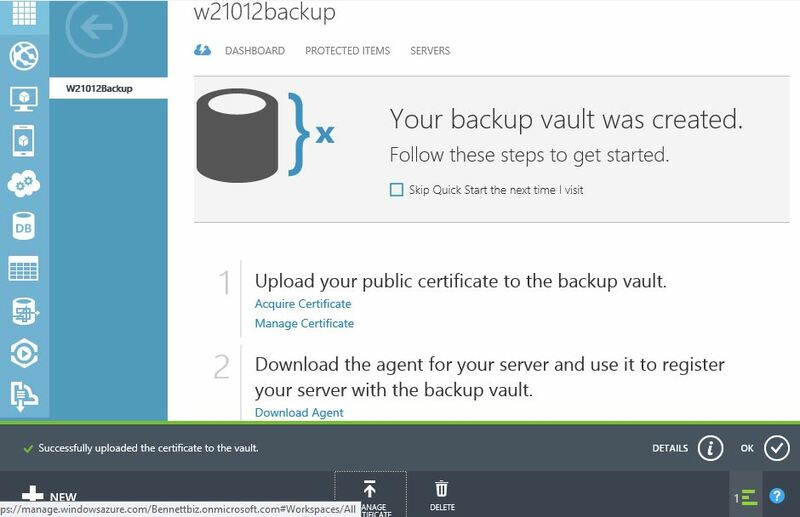 Once your account has been created, click on the Portal link then create a Backup Vault in Recovery Services. Double clicking the name of your vault (you assigned this name when you created the vault) will display the details about your vault, including the server it’s connected to. 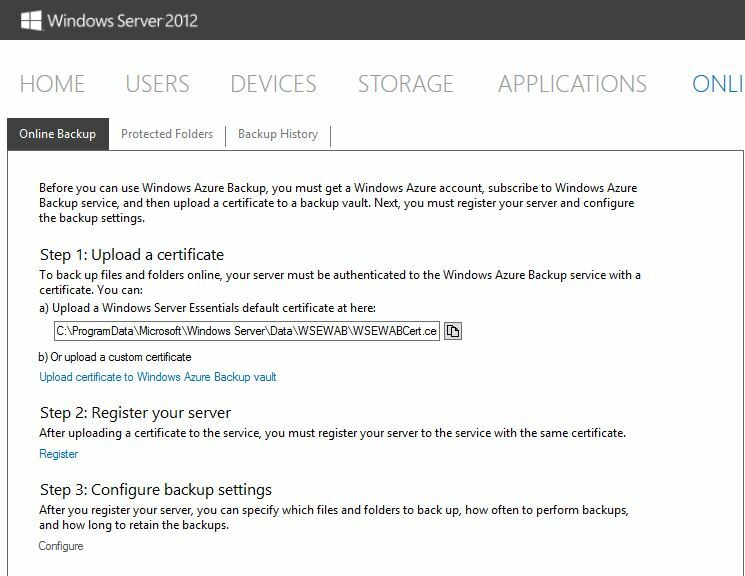 At this point you can now start connecting your Windows 2012 Server Essentials to Azure. Click on Step 2 Download agent. This will install the connector. Add the Online Backup tab on your server Dashboard. Follow the prompts to install the add in. 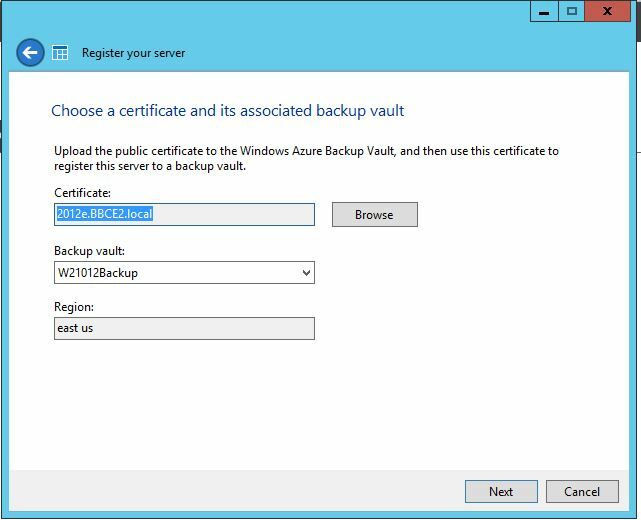 You will also have to copy your server certificate to Azure backup. 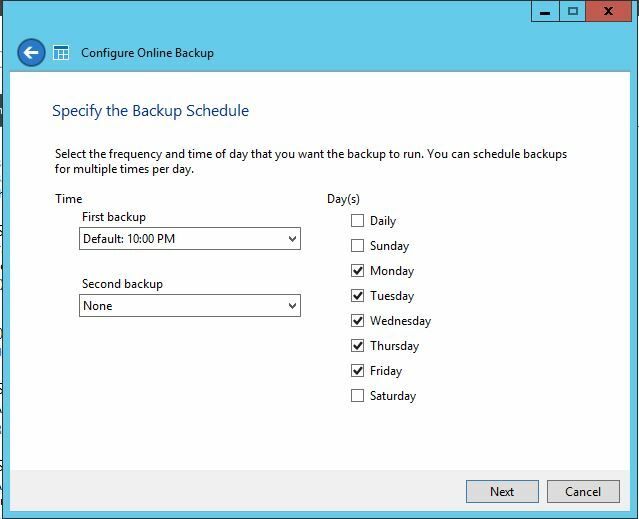 To do this, access the Azure Online backup from the new Online Backup tab on the Dashboard. Click the copy button beside the certificate path. Switch back to your Online vault and select Manage at the bottom of the window. Click the Browse for file link and then “paste” the data from the previous copy. The certificate will be added to the vault. 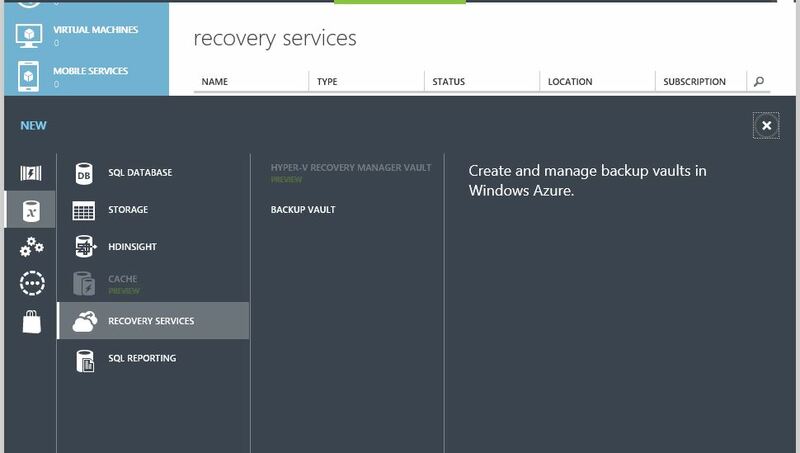 Your server is now registered with the Azure online backup. If you have made it this far, hang in there a few more steps and we can setup the backup. You can now register the server with the online backup from the Online Backup tab. Fill in the dialog boxes if necessary. You are now required to come up a long passphrase. It took me 3 tries to come up with one long enough. 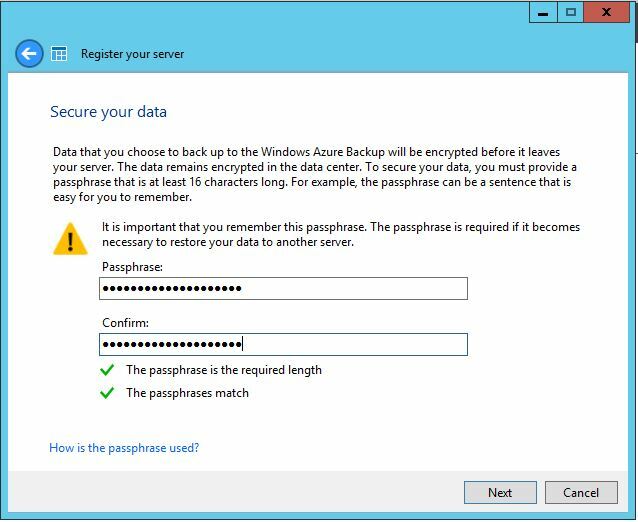 You can reset your passphrase if you forget it, like I have. After a few more dialog boxes your server will be registered. 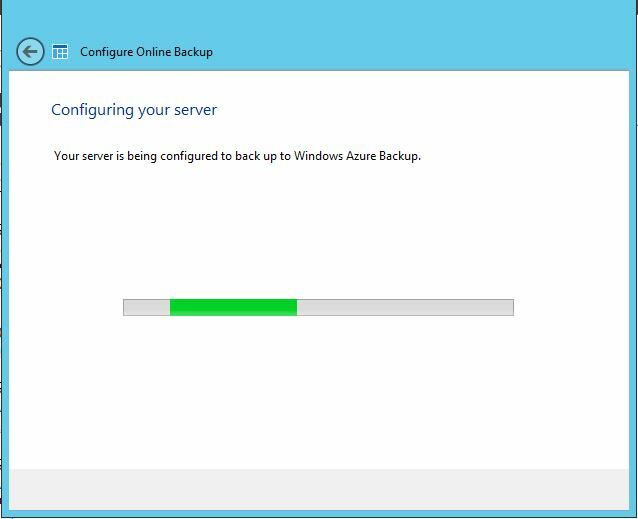 We can now finally start backing up our server to Azure! Yes, it’s been a long procedure to this point. I promise it gets easier now. 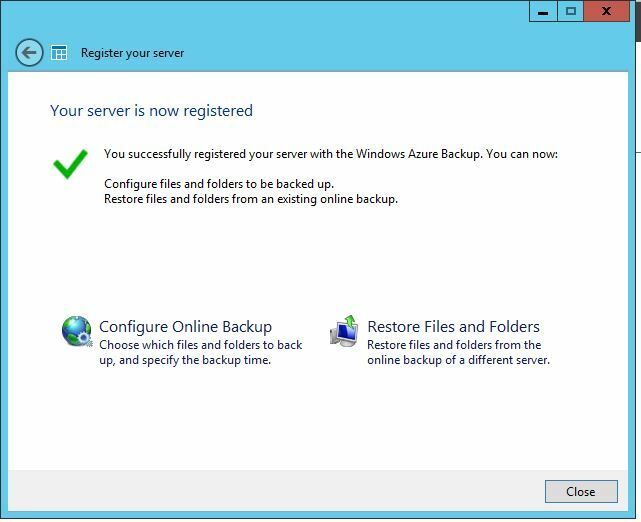 To configure our Online Backup either click the icon in the completed registration window (above) or select the Online Backup tab from the server Dashboard. Select the appropriate files/folders for your backup. Then, how often you want the server to be backed up. Next, pick your retention policy. 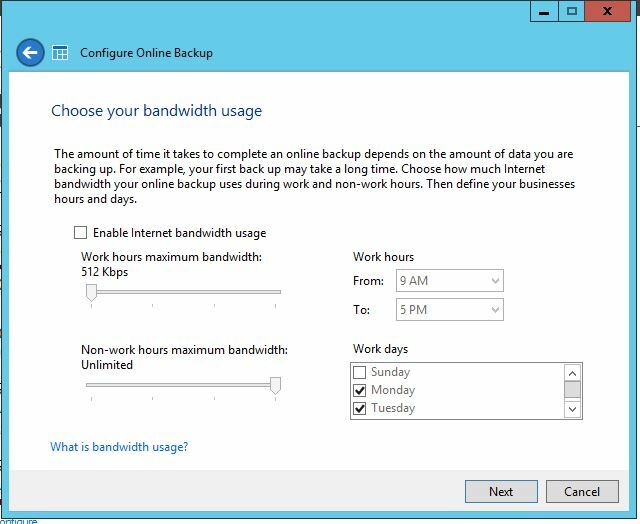 You now have the option to configure how much bandwidth the backup can use. Your server will now prepare your backup. 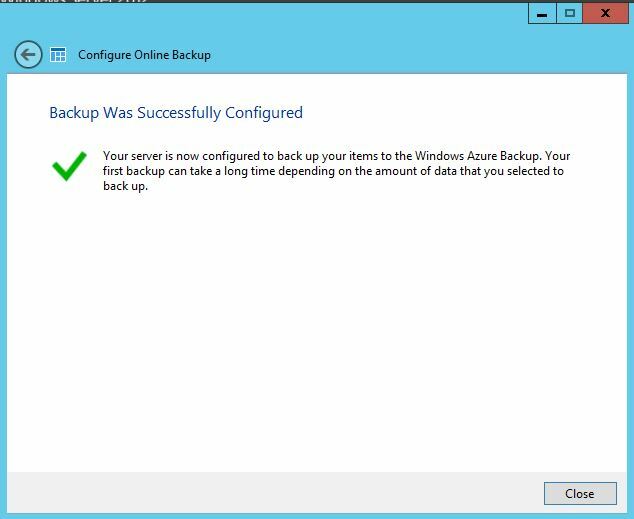 Finally…we have successfully configured the online backup! 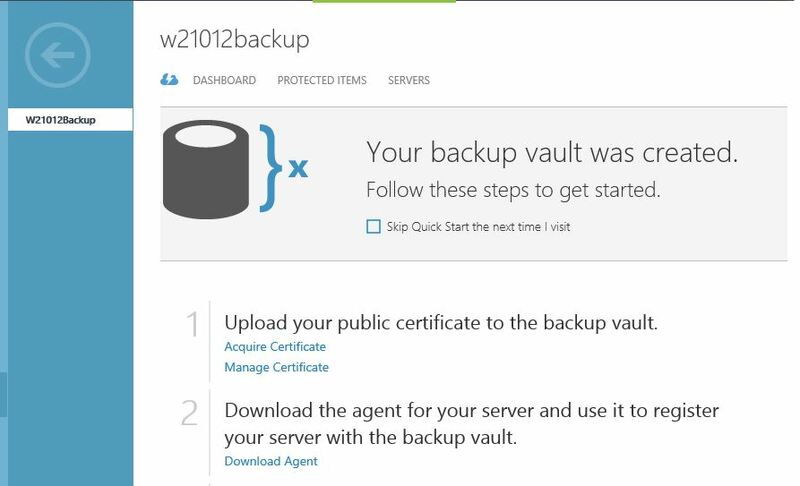 Before we finally say it’s complete, I would suggest you start a backup and verify the server is backing up to Azure. I have to admit this process took some time, but I think that was more my inexperience with Azure than with either product. The first time I setup Office 365 it took longer than I thought, now I can do it with my eyes closed. Trust me, this will be worth the time and effort. If the unthinkable does happen, the company data, the heart and soul of the organization, is kept safely off-site and can be easily retrievable. Missing my slippers…but loving the heels Is the cloud really that scary?